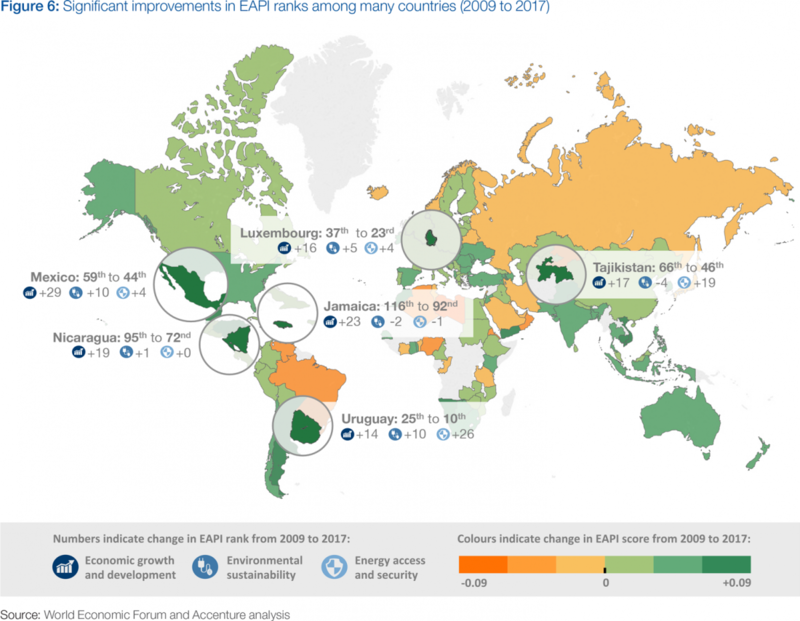 The global energy system is often perceived as slow to change, as reflected by the modest improvement in the 2017 average EAPI score compared to the 2009 benchmark (0.78 vs 0.77). However, a number of countries are challenging this view of collective inertia, having significantly improved their rank since 2009 (Figure 6); those include Jamaica (116th to 92nd), Nicaragua (95th to 72nd), Tajikistan (66th to 46th), Mexico (59th to 44th), Luxembourg (37th to 23rd) and Uruguay (25th to 10th). Achieving such improvements is no small feat, no matter what the starting point. As policy-makers pursue their own improvements, they often look for lessons learned from analogous countries. Regrettably, no solution can be seen as a one-size-fits-all remedy, and the differences between countries mean that each needs to find its particular path. However, some commonalities surface when looking at the journeys of these most-improved countries. This section draws on examples from three of them to examine some of the factors that have supported improved performance. The countries have been selected from the bottom, middle and top third of the rankings to represent a diverse range of baseline starting points. These principles are mutually reinforcing, building on each other to create affordable, secure and sustainable energy systems. A clear frame and long-term direction is needed to form the basis of policy goals and provide a sense of stability required to encourage investment. Adaptable, co-designed policies establish the conditions for achieving the energy sector’s vision. Stewardship of investment directs the capital required to support the energy transition to the right projects that will drive progress. Taken together, these principles have been shown to contribute to high-performing energy sectors and generate significant improvements, as explored in the next section.